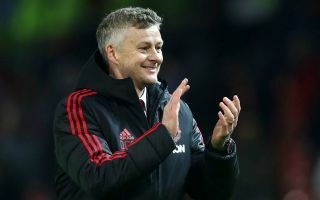 Man Utd face Tottenham in the evening kick-off on Sunday, with Ole Gunnar Solskjaer hoping to make it six consecutive wins in all competitions. This will undoubtedly be his toughest test since being appointed interim boss last month, with Spurs looking to keep the pressure on the likes of Liverpool and Man City at the top of the Premier League table. However, the Red Devils are in fine form themselves having rattled off five consecutive victories under Solskjaer, as they look to go level with Arsenal in fifth place with a win this weekend. As seen in the club’s tweet below, Paul Pogba returns to the starting line-up after missing the win over Reading in the FA Cup last weekend due to an injury, while there are two changes to the side that beat Newcastle United last time out in the Premier League. Ashley Young and Jesse Lingard come in for Antonio Valencia and Juan Mata, as Solskjaer has certainly gone for an attacking line-up with plenty of pace and attacking intent as both Marcus Rashford and Anthony Martial also start. It promises to be a thrilling encounter between these two sides, but it remains to be seen if United can now step up against top class opposition and continue to flourish under their temporary boss. Based on the tweets below, many United fans were delighted to see Martial start in particular, but there was a generally positive response to the line-up as Solskjaer has seemingly struck the right chord with them and is making the selections that they want to see. Martial Rashford and Lingard going to set Wembley on fire!! ?